UNIT 1 SECURITY AND PRIVACY. In this part of the unit we are talking about how to make sure communications through a shared and insecure channel, like internet, where there are many bad guys, who might intercept the messages, read and modify them, and even usurp the identity of other people with evil intent. 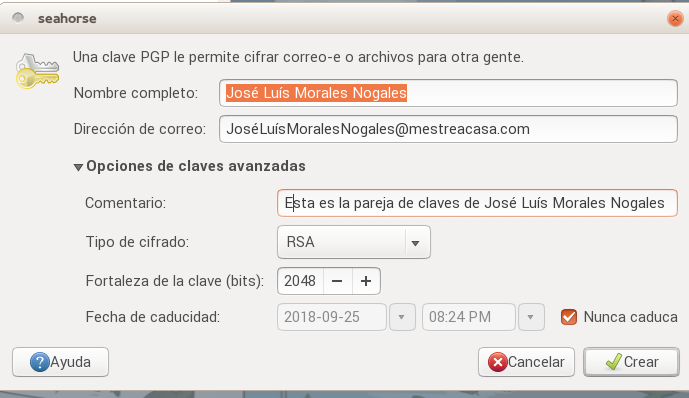 In this activity you will learn how to use asymmetric encryption based on P.G.P. You will create a couple of public-private keys. You will exchange public keys with a classmate, and you will use your respective public keys to encrypt a secret message that only your classmate will be able to read. This activity must be carried out between two students. So, choose a partner among your classmates. Nowadays Internet is extremely insecure, and any information moving through the net may be intercepted by third parts. This includes confidential information as our personal data, our bank account credentials, login and passwords. How to make sure the data travelling through a public network are hidden for anybody else safe the legitimitate receiver. This can be done encrypting the message. To encrypt is to transform a readable message in something unreadable for everybody else except the legitimate receiver. 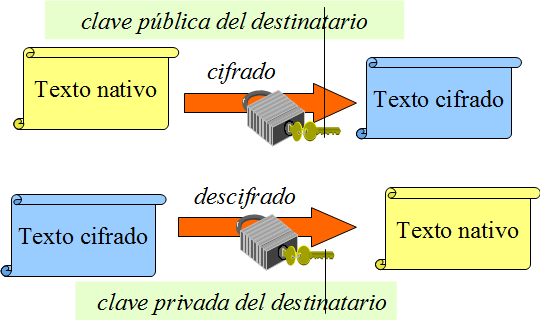 The opposite process, decryption, allows the receiver to decode the unreadable message turning it readable. There are two types of encryption: symmetric and asymmetric. 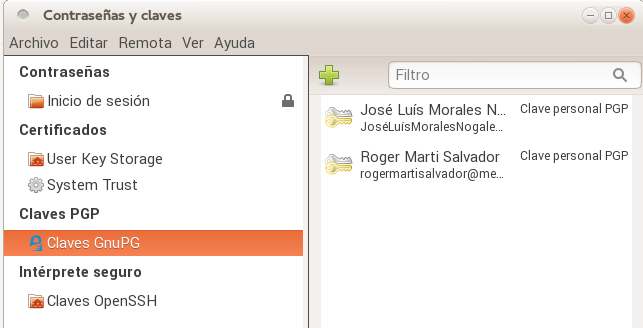 It uses a single key that must be known by the sender and the receiver, both to encrypt and decrypt. Enter your personal information: full name, email (you can make it up) and a comment. Finally a message tells the key has been created. The default values are correct . Encryption type RSA , length ,and never expires. 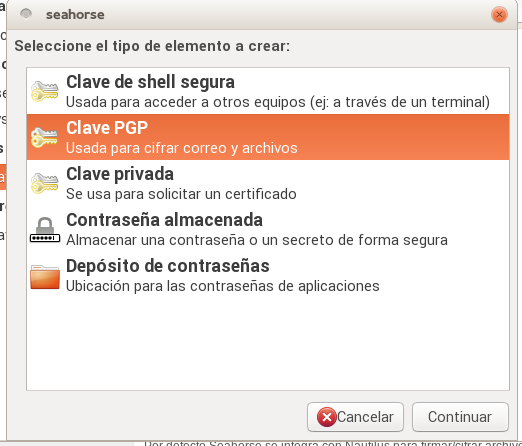 Select your Key in Seahorse and select the menu archivo→exportar. This will store you public key in a .pgp file. 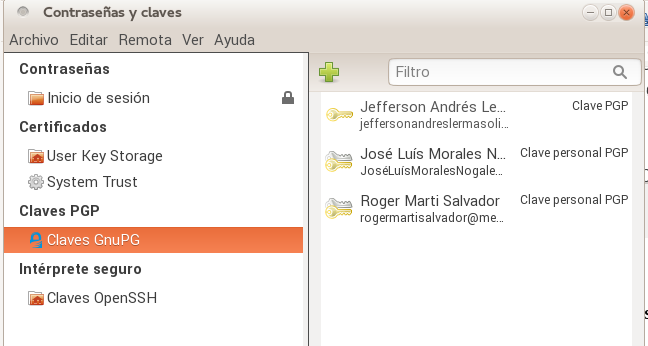 Send the .pgp file to your class mate by email. He/she must sent you his/her exported public key too. 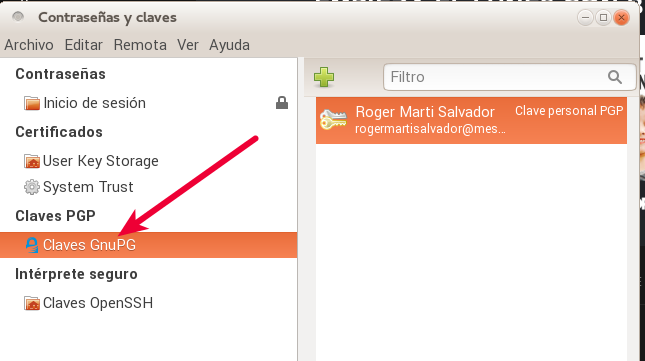 Notice that the imported public key is shown next to a single key icon…..
Next send the encrypted file to your partner by email. Your partner in this activity should already have sent you his/her own secret message in an encrypted file. 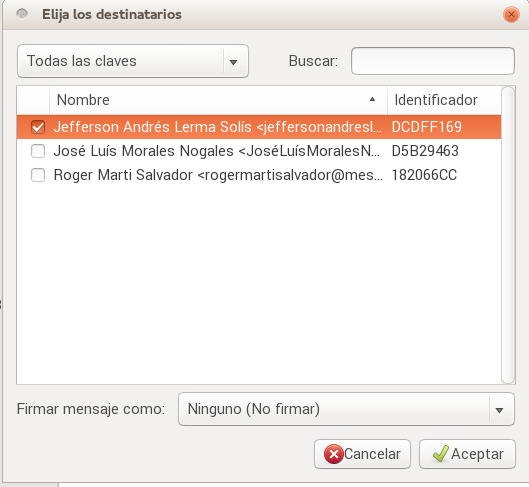 To decrypt it, select it in Nautilus, drop down the contextual menu (right mouse button) and select the menu option Abrir con descifrar fichero. Remember, he/she has encrypted the message using your public key. 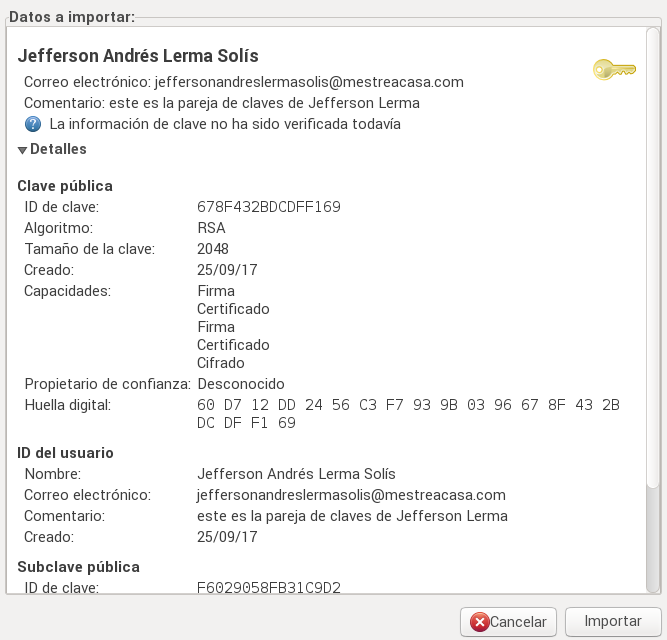 To decrypt it will be necessary to use your private key, and we had protected it with a password. Search in internet another famous phrase. Write it in a text file using Gedit. Write down your surname and name and the famous sentence. 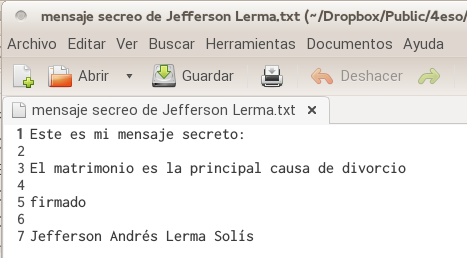 You are expected to encrypt this file and send it to the teacher. So, first you have to import the teacher's public key.